Galena City Hall is located at 101 Green Street, Galena, IL 61036; phone: 815-777-1050. Photo: Henry W. Miller House, ca. 1847, 11672 West Norris Lane, Galena, IL. Listed on the National Register of Historic Places in 2010. Photographed by user:Boscophotos (own work), 2015, [cc-by-3.0 (creativecommons.org/licenses/by/3.0)], via Wikimedia Commons, accessed November, 2015. "Galena" is the Latin name for lead sulfide and was given to the small lead mining settlement in 1826 by its mining population. Lead had been sporadically mined along the Fever (now Galena) River for thousands of years prior to the arrival of Europeans. The Native Americans used it for ceremonial powder, paint and sometimes magical charms. The French noted their shallow mines as early as 1690 and quickly moved to gain control of the lead trade. Julien Dubuque, through a treaty with the Fox and Sauk Indians in 1788, either mined or encouraged the mining of lead on both sides of the river. Dubuque, Iowa is named after him. The Americans began moving into the Galena area in large numbers following the first government issued leases in 1822. Aware of the value of lead, the federal government would only lease mineral lands, thus retarding permanent improvements in the lead region. The law was changed to permit private ownership in 1836-7 for Galena and several other towns, but not until 1846-7 for the rest of Jo Daviess County. Because of the value of lead, which was used for musket balls, paint, roofing and flashing, water pipes, pewter and tin, a rush for the lead region began. It peaked in 1845, when the region (with Galena as the hub) produced 55,000,000 pounds, or 85 percent of the nation's lead. During this time, Galena gained state and national prominence. The lead rush here was the first major mineral rush in U.S. history and preceded the California Gold Rush by 20 years. Because of the lead trade, Galena entrepreneurs were able to establish a near monopoly on the Upper Mississippi River steamboat trade that lasted until the Civil War. Although three miles from the Mississippi, Galena was the largest port north of St. Louis for 30 years. The town's business interests had invested heavily in every sector of the economy, from smelting to wholesaling and retailing stores that serviced the present states of Iowa, Wisconsin, Minnesota and beyond. It was during this time that fortunes were amassed and mansions of all types and sizes were built. Galena became a "must see" place for the early travelers of the period. Its population peaked at 12,000 in 1857, but declined steadily thereafter. Immigration also peaked then. The first miners and settlers were from southern Illinois, Missouri, Kentucky and other Ohio River states. Many of them had strong ties to southern traditions and beliefs. These connections gave Galena, an otherwise "northern" city, a somewhat "southern" quality, particularly as it related to politics. These people tended to be Protestants, Democrats and States' Rights advocates. Many had no particular problem with slavery, provided it was kept in the southern states. With time, however, Galena became home to many other groups as well. A relatively large number of free Blacks (perhaps 250 by the time of the Civil War) lived in town. Their numbers decreased rapidly after the War, as they left to find jobs. Many Germans (often highly skilled) came in the 1840s and 50s. They came because of political and economic conditions in Europe. Large numbers of Irish came, too, particularly with the potato famines of the 1840s. Cornish and English miners came hoping to work the mines. And large numbers of New Englanders and New Yorkers came, too, many looking for farms, not mines. Into this mix came Ulysses S. Grant in April of 1860, with his wife and four children. Grant's father was in the tannery business in southern Ohio. He was involved in a leather goods store in Galena as early as 1841. Business was so good that he sent Grant's two younger brothers, Simpson and Orvil, to manage the store in Galena. Meanwhile, Ulysses had resigned from the Army and gone to St. Louis to be with his wife and her family. After failing at several business ventures, Grant's father finally sent him to Galena to help his brothers. One year later the Civil War erupted. U.S. Grant, a West Point graduate, left Galena a little known private citizen, but returned in 1865 as the victorious general of the Union Armies. Eight other Galenians also achieved the rank of General for services rendered during the War, more than any other town of Galena's size. Upon his return, Grant was given a new home on the east side of town. 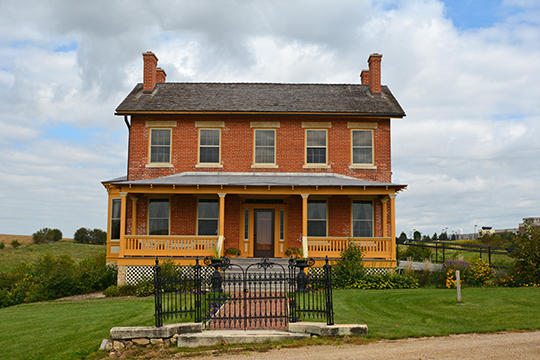 Although he was able to spend little time there, he maintained Galena as his official residence for 20 years (1860-1880). His home, always open to the public, was given to the City in 1904 and then to the State of Illinois in 1931. The State also owns the City's Old Market House and the Congressman Elihu B. Washburne Home. Washburne was one of the founders of the Republican party in Jo Daviess County in 1855-566 and also one of the most powerful lawmakers in Washington at the outbreak of the Civil War. He was a central figure in furthering the military and political careers of U.S. Grant. Galena declined rapidly with the Civil War. Low lead prices and reduced production were the rule after 1847 when all mineral lands were put up for sale. Agriculture had become dominant in Jo Daviess County. The Galena River had silted in so badly (from soil loosened by picks and plows), that steam boats were avoiding it. The coming of the Illinois Central Railroad in 1854 further weakened Galena's trade monopolies. The Illinois Central was controlled by Chicago investors; over the next few years they successfully challenged Galena's trade. The Panic of 1857—a nationwide depression—hurt Galena further at a critical time. This, combined with the Civil War which disrupted Galena's river trade with St. Louis and beyond, hurt the town even more. Finally, increasingly bitter politics between Democrats and the new Republicans weakened City government. They found themselves unable to effectively address the City's problems. Following the War, Galena became a small, increasingly agricultural trade center. Today, Galena is nationally recognized for its history and architecture. Over 85 percent of the town was listed in the National Register of Historic Places in 1969. Its location within the Driftless Area—with its unglaciated hills, valleys, ridges and scenic vistas—adds to its attractiveness. Over one million people visit the community annually. Other communities and sites have tied into this phenomenon, such that the entire county now represents a strong tourist destination. County Board, Jo Daviess County, Illinois, Comprehensive Plan 2012 Update, www.jodaviess.org, accessed November, 2015.